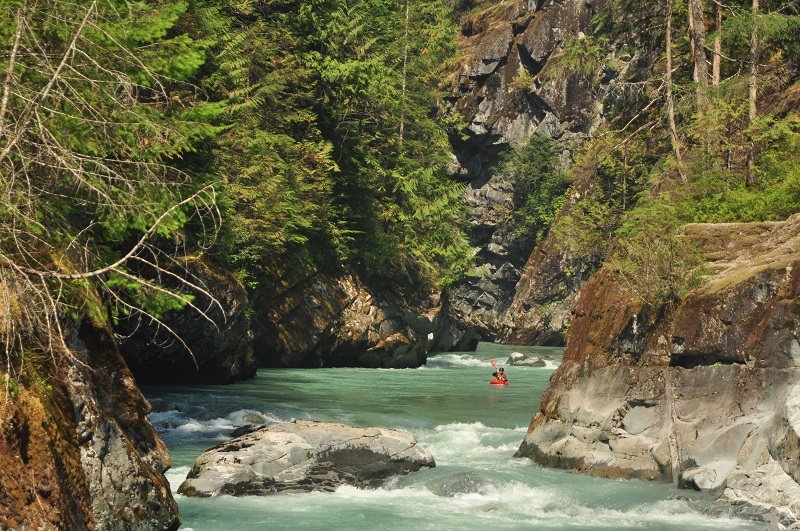 What It's Like: The signature run of southwest BC - clean bedrock in a deep box canyon. Scouting/Portaging: Difficult - impossible to scout or portage in spots. Level: Online gauge: Ashlu gauge by Innergex. Visual gauge at put in. Time: 2-3 hours. Sub 30 min laps when you know it. When To Go: This river is now dammed - has releases in May, August and September. Possible when the dam spills over at times of high flow. Other Beta: The Range Life have heavily documented this river. Map: Click here for a map of the river zone. 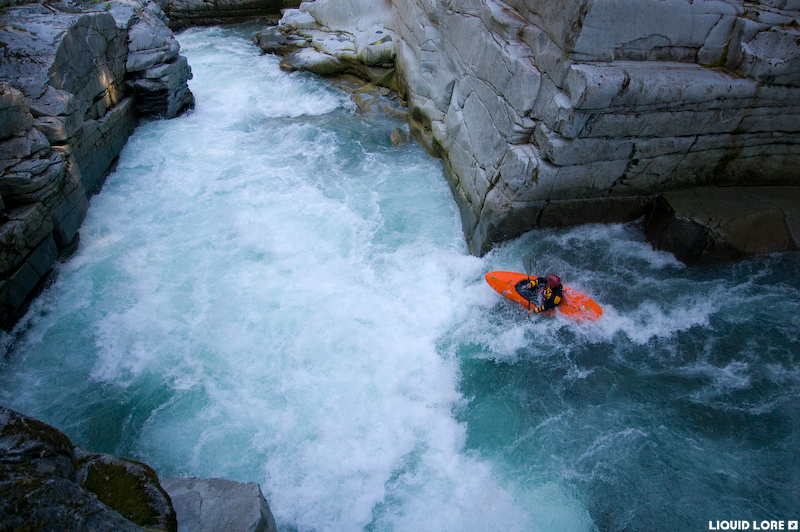 The Box Canyon of the Ashlu is the signature class V kayak run of southwest BC. 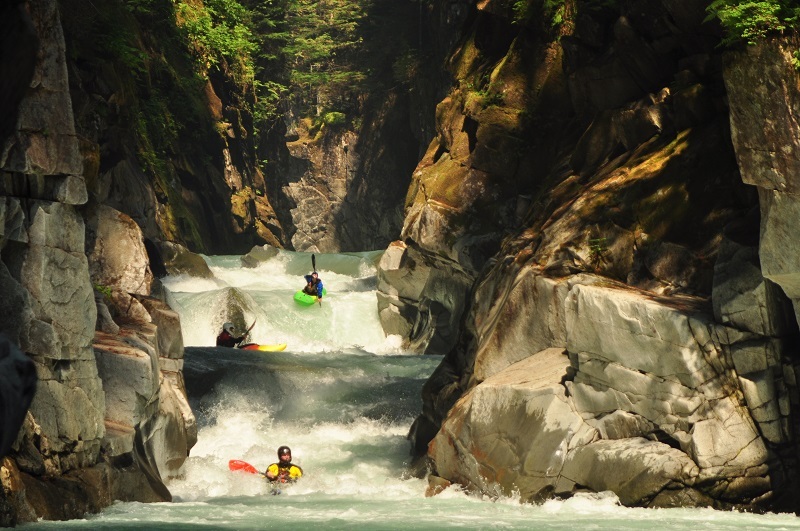 It is the epitome of boating in the area with an amazing valley, beautiful scenery and classic whitewater all locked down in a deep canyon. 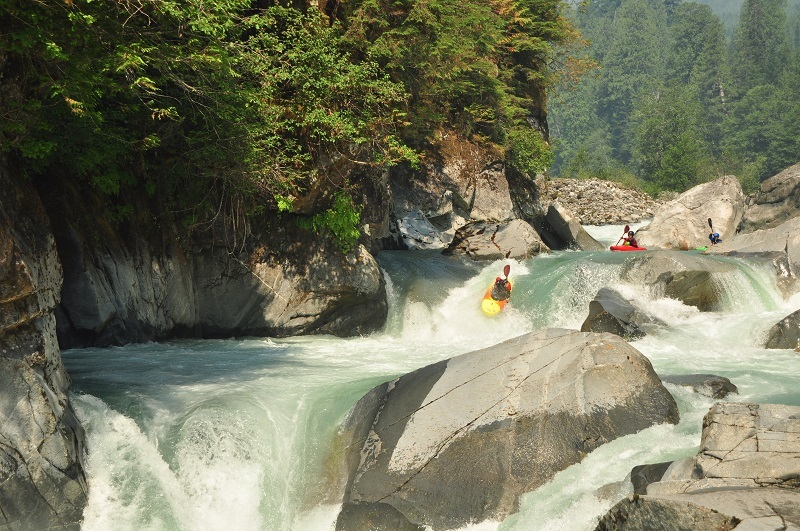 This legendary river was changed in late 2009 by the completion of a run-of-the-river hydro scheme - luckily there is a robust recreational whitewater release schedule so the river can still be enjoyed to the fullest, arguably as the most reliable, highest quality run in southwest BC. Access to the Box is along dirt roads that are well maintained because of the power scheme. Head out of Squamish and up the Squamish valley. Shortly after the road turns to dirt take the bridge over the Squamish River to head up the Ashlu. Drive past the powerhouse and put in at the bridge over the river (stay right at the obvious fork). You can't miss it - the canyon starts just below the bridge. The take out is a few kilometers downstream - at the steep hill look for the avalanche path - there is ample space to pull over. Hike up this avalanche path from the river. Flows on the Box no longer follow a natural pattern because of the diversion. It is possible (and common) to paddle the river when there is too much water to be diverted at the height of summer snowmelt and in the fall after big rains. 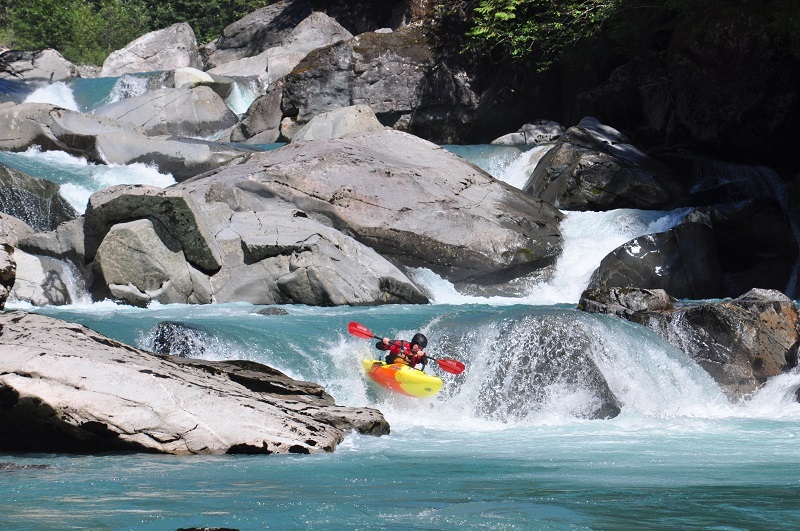 Outside of these unpredictable events there are up to 24 recreational whitewater releases each year on weekends in May, August and September. 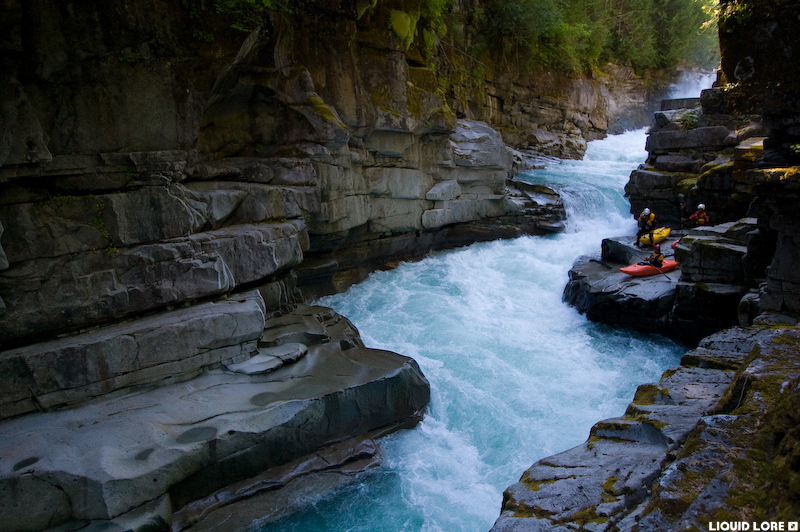 Here is a web page detailing the release system from a kayaker's perspective. The power company provides an online gauge for this river, and announce what flows are predicted to be when a release is to happen (via email - you have to sign up for the release to get this information). The definitive gauge for the Box is the visual staff gauge at put in bridge. 0.5 m is low, and 0.75 m is high. This corresponds to a range of approximately 15-28 cms on the online gauge. It is doable at higher levels, but this is not recommended unless you are familiar with the run. The Box Canyon comes out swinging. Upstream of the bridge there is a wide ledge called Last Tango that marks the end of the Mine/Mini-Mine section of the Ashlu. Below the bridge is a 25-30 waterfall called 50/50 at the start of the canyon - it gets run all the time but it's not without several unpleasant consequences. You can start below this by taking a river left trail to where you can climb down to a granite platform that is next to the water. The section below 50/50 deserves a scout from the canyon rim if you don't have a guide - there is an easy-to-follow trail along river left. 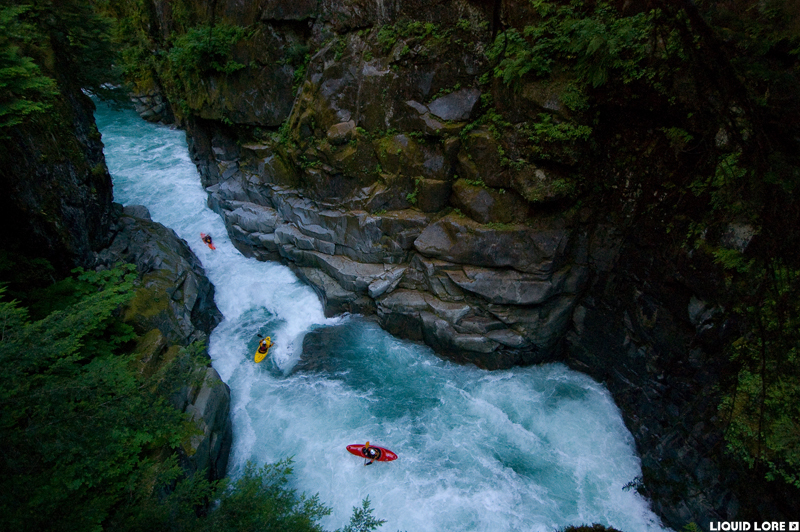 The trail ends at Triple Drop, a multi-move rapid that can't be scouted or portaged at river level. Below Triple Drop things open up a bit until the canyon ends in a wide gravel bed. 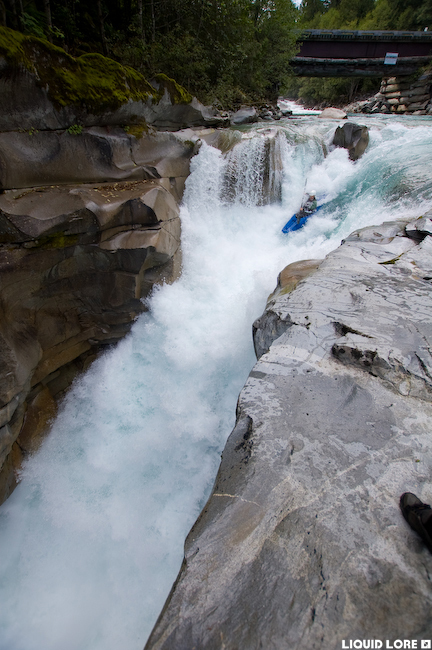 The second part of the canyon starts with a long entrance rapid followed by a double drop and then a rapid that is easiest dealt with along the left side. You'll know you've reached the take out when you pull up to a huge horizon line. This is the start of section between the Box and the Bottom Mile that rarely gets run. Enjoy this slice of BC splendor. Be careful and have fun! One of the put ins if you're not in to running 50-50. In the heart of the Box Canyon. 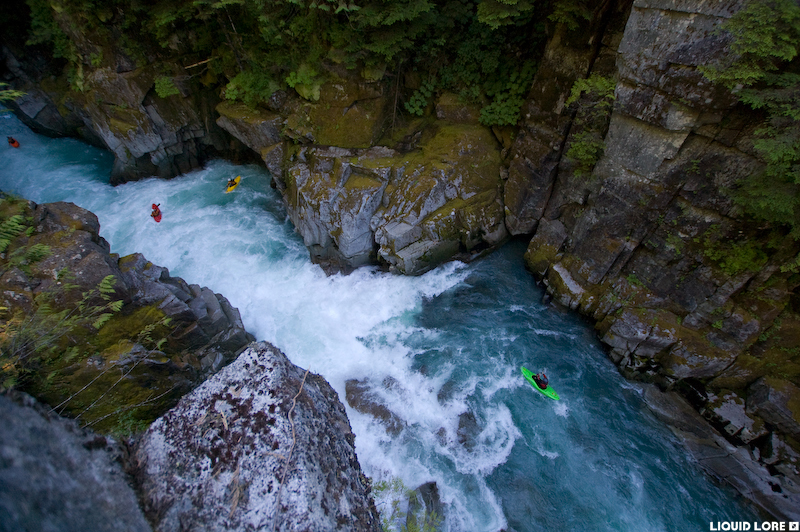 Triple Drop, shot upstream from the top of the next rapid. The double drop. This drop changed drastically from what it looks like here in the fall floods of 2017. Easy floating at the take out.